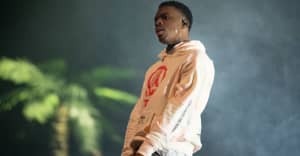 Vince Staples has released a short film, sharing a title with his brand new EP, Prima Donna. The 10-minute, Nabil directed movie finds Vince wrapping a music video, head between two nearly naked female butts. He unenthusiastically exits the shoot and gets in a cab and that's where things get weird. Enter Vince's fever dream. He starts seeing things and gets taken to a hotel called The Prima Donna, with heavy Shining and American Horror Story vibes. Watch the surreal journey above and reread Vince Staples's FADER cover story.